I don't think I've done a challenge to utilize "white space". I hope I left enough to be acceptably classified. I used another one of PTI's wonderful sets. I wish I owned all of them but as it is I hardly get time to use the ones I have (I have so many and keep an open Shopping Cart all the time...blush, blush). Base card is white. A piece of Kraft Prints Pack was placed on the lower third of the card. Taupe Kraft Grosgrain ribbon was wrapped around the seam. 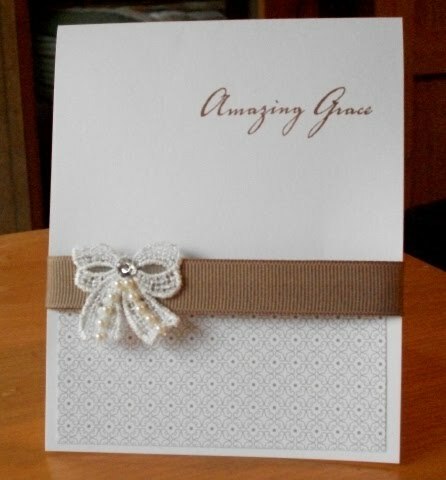 I had a pack of vintage stickers and used a bow with pearls and a rhinestone. "Amazing Grace" was stamped in Close to Cocoa. A sentiment from the same set was stamped inside. It reads "The best and most beautiful things in the world cannot be seen or even touched. They must be felt with the heart. Helen Keller" Let me know what you think.